Here’s the basic process of using a Wyeast Activator Smack Pack. While some Wyeast online resources showing the best way to activate the pack were helpful, I found the directions on the pack itself to be the easiest. 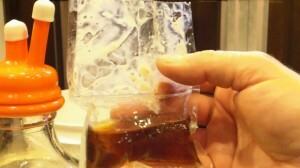 On my first attempt, the nutrient pouch inside the smack pack did not break, but I decided to pitch it anyway. After doing some research I found out that the yeast does not even need to “activate.” It’s just used to get the yeast going and test viability. Per Wyeast, you can pitch without activating and it will work just fine. 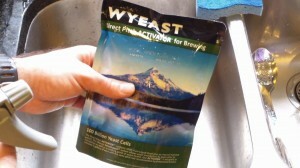 Anytime you’re using liquid yeast make sure to sanitize the outside of the pack first before it’s opened. I have had overflows before, and it is suggested by the manufacturer, so just to be safe – sanitize. Next we must activate our direct pitch activator inside the smack pack. The outside of the package shows a few different ways, and I watched a video online that shows how to find the pack on the inside so you can put it in the center and smack it that way. However, the instructions on the package seem to make it a lot easier. 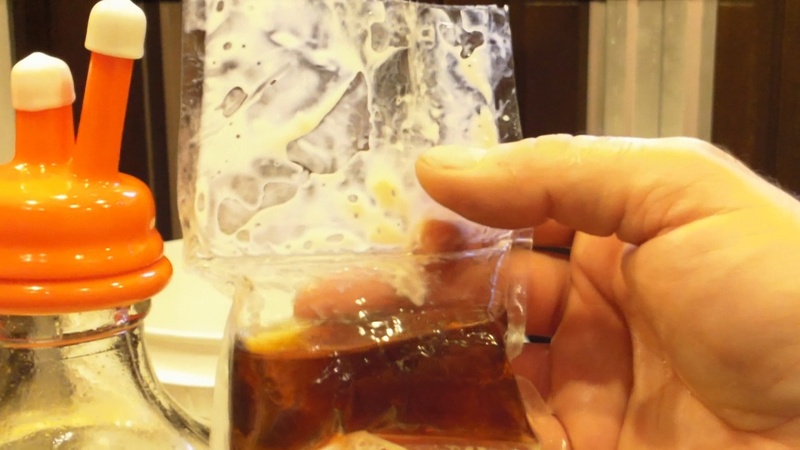 They say to put the pack up against one of the corners (by tilting the package), hold it in the palm of your hand, and use the palm of your other hand to smack it open firmly. Once you’ve done that you should be able to feel around and make sure it’s been popped. They also show online that you can take it and work it back and forth to ensure the nutrients get mixed around. Make sure to start this process about three hours before pitching. I chose to do mine during my mash, when I had a little over an hour left. Also make sure to give it a really good shake to mix up those nutrients. 1:50 I begin by opening the top of the pack and checking inside. Upon my inspection it does not look like I popped the nutrient package. I decided to go ahead and add the yeast to my carboy. Even though it felt like it broke and it swelled up a bit (maybe by just warming-up to room temperature), it did not break open. I’m not quite sure what happened. I read online that it is not a full requirement either to pop and add both the yeast and nutrient, so we will see what happens with it. 2:44 I did check up on whether the Wyeast smack pack needs to activate (with Wyeast) and they said it doesn’t even need to activate. It’s just used to get things going, you can pitch it without activating it and it will work just fine. So I left everything as is, didn’t pour the nutrient pack in (just pitched the yeast) and didn’t worry about it.